A deal has been offered, a deal has been rejected, and the strike at more than sixty UK universities goes on. Ed Rooksby has brought the history of the dispute up to date — the swelling numbers of academic staff joining the University and College Union (UCU), the unprecedented numbers of UCU members on picket lines, the radicalism of students, and broad support gained from the general public. Rooksby also outlined the first deal made between UCU negotiators and Universities UK (UUK), the body representing university managers — and the angry response from UCU members, who have so far overwhelmingly rejected the agreement. “No capitulation” has become a slogan on picket lines and on social media, used to galvanize members to maintain the strike. It has encouraged the UCU’s Higher Education Committee (HEC) to refuse the offer and stay on strike. Regardless of how the strike plays out, we can already draw lessons from it. First, it underlines the need to pay attention to previous struggles. Second, it reveals the power of international solidarity. Finally, it reminds us we cannot reduce a strike to the technical details of the dispute. In the final analysis, momentum and morale count as much — if not more — than the right data or the best arguments in the negotiating room. These lessons aren’t restricted to college and university campuses. They apply to — and draw on — the struggles of workers in industries very different from higher education. This strike, as so many people have pointed out, has a long history: permanent employees have seen their wages stagnate; many academic jobs are now part-time and temporary; student fees keep rising; and universities operate as (rather inefficient) businesses. These issues have fed into a simmering discontent across British higher education. If not over pensions, a strike may well have erupted over some other issue, with the same explosive effect. This strike was called after the UCU had given in on these questions for the past decade or more. The union and its members accepted earlier pension cuts. They met the stagnation in real pay with an ineffective one-day strike in October 2013. Anti-casualization activists within the union have never had the reach or resources to mount an effective national campaign, and so much of the resistance to the changing nature of academic work has taken place in local movements outside union structures. Many UCU members saw the proposed deal on March 12 as a return to this record of defeat. They felt that accepting the offer would make the current strike another example of the union’s failure to resist the continual pressure universities apply against their workers. But academics have started to learn from their previous failures. Many workers took to social media, to their local branches, and to their picket lines on Tuesday morning to urge UCU leaders to reject the deal, showing that members are not willing to abandon yet another red line. They would rather go down in honorable defeat than accept a shabby offer that would further embolden university managers to erode pay and working conditions across campus. To their credit, the UCU leaders learned from some of these failures before and during this strike. Instead of mounting it as a series of one- or two-day strikes, which were ineffectual at best and demoralizing at worst, they planned a sustained action that would ramp up the pressure on Universities UK and individual university Vice Chancellors (VCs). The fruits of this new strategy are plain to see. Numerous VCs have broken their silence and called on UUK to reexamine the proposed changes to the pension plan. 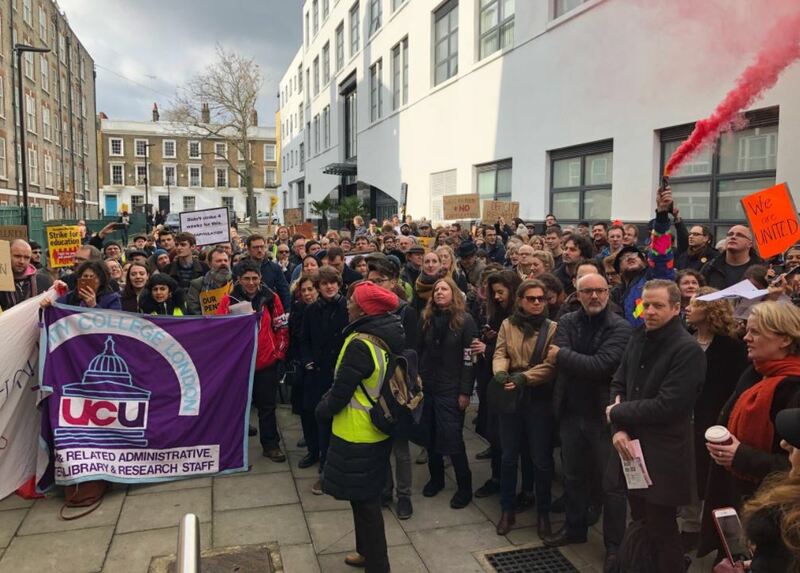 The strike has also brought thousands of new members into the UCU, forged new bonds of solidarity between students and staff, and raised new possibilities for action on all the other issues that plague academic workers and students. UCU strikers have learned from other workers as well. Almost as soon as the details of the offer appeared online, people from all over the United Kingdom cited one example above all others: the cleaners’ and support staff strike at the School of Oriental and Asian Studies (SOAS) in London. Those workers, most of them immigrants from South America, led a long struggle to secure a living wage, sick and holiday pay, pensions, and an end to outsourcing. They survived raids by immigration, which scooped up and deported those without valid visas, and they refused paltry offers that did not meet their demands, holding out for something worthwhile. Their example inspired cleaners at the London School of Economics to take industrial action and then to reject a series of concessions in order to achieve a larger goal. Now their example has helped academics resist a bad deal. Instructors like to say that we learn as much from our students as they learn from us — we have realized that we have much to learn from our other comrades on campus. UCU members also learned from the failure of the 2016 junior doctors’ strike. As in the current academic strike, the dispute between junior doctors and the National Health Service went to the Advisory, Conciliation and Arbitration Service (ACAS), a public industrial conciliation service. When arbitration began, the junior doctors returned to work on the understandable grounds of patient safety. But once they abandoned their main bargaining tool — the work stoppage — the government rammed through an agreement that met none of their demands. The UCU leadership did not fall into the same trap. When the dispute was referred to ACAS conciliation, the strike continued. UCU members, myself included, might not have accepted the March 12 deal, but it was better than UUK’s original offer. If the union leadership had not heeded the example of the junior doctors, we might have already lost this struggle. By a happy coincidence, the UCU industrial action started the same day teachers in West Virginia walked off their jobs. Their strike had a profound effect on us, showing us that we are not the only ones trying to defend education, the careers of those who provide it, and the future of those who receive it. UCU members on strike, and especially those of us who opposed the March 12 deal, can take heart from the West Virginia teachers. Their struggle was, after all, much harder than ours: they had to struggle not only against the state government but also their own union; their determination and solidarity overcame both obstacles. Academics can learn from the public schoolteachers’ ability to mobilize students. The UCU has enjoyed student support, but it doesn’t have a coherent national strategy to mobilize this solidarity. As the strike goes on, we need to figure out how to maintain our alliances with students. Having them on our side will be a crucial component of victory. Nor will we forget the generosity of the West Virginia teachers to us. I know from personal experience that seeing the picture of three striking teachers in the state capitol holding a placard showing their solidarity with the UCU had an enormous effect. We discussed the image on picket lines and social media. It bolstered the spirits of those handing out leaflets to passing motorists in the snow. It inspired a rash of photos returning that solidarity. The West Virginia teachers have broadened our horizons, and they have encouraged us to remember other struggles waged by education workers in other parts of the world. Signs proclaiming solidarity with West Virginia soon also mentioned striking university staff in Finland. We also received messages of support from workers of various kinds from all over the world. International solidarity has gone from being a pleasant phrase to a source of strength for those of us now on strike. A picture or tweet or message of support can raise morale; a victory in one country can encourage those struggling in another; and the successful strategies used in one action can make victories elsewhere more likely. This strike has been one long argument for learning from history. By mobilizing so quickly to defeat the March 12 proposal, we have staved off a potential disaster — demoralizing workers solidly on strike for a decent pension. By learning from our earlier failures and from the successes of other workers, we have resisted the temptation to accept the first offer we received and call a premature end to the action. But this strike is not over. It will pause next week, as most universities take a four-week break over Easter, and it may well restart once classes begin again. There are rumbles of fourteen more days of industrial action, or even a marking boycott and a delay in conferring degrees to final-year students. The learning process of the strike will go on too. There are, after all, consequences to rejecting the March 12 deal. Having put its name to the deal, the UCU must now reckon with the fact that the public might see the union as the aggressor, as the one rejecting a compromise, rather than as the party defending a decent pension. Students, too, might start to shift their support. This number will not include all of them, as many students spend more time on the picket lines or in occupations than do some UCU members. But if things go badly, enough students wavering in their support could turn wider opinion against us. Even some UCU members might lose their enthusiasm for the fight. No one welcomes the prospect of losing fourteen more days of pay. For many people who work, as I do, on temporary contracts and face involuntary unemployment over the summer, the financial burden might prove too much to bear. If the strike drags on and begins to appear as a lost cause, a slow trickle of financially insecure members returning to their duties might provoke a flood of UCU members back to work. The consequences of failure now, as Ed Rooksby pointed out, are great. The strike has unleashed so many other passions — against casualization, against pay stagnation, against the whole corporate model of the modern university and the capitalist system that sustains it — and it contains the promise of real and collective action on all of them in the future. A defeat now would mean a retreat on these fronts as well as a cut to our pensions. We cannot allow that to happen. Having just staved off capitulation, we must prepare for the next challenge, whether it is maintaining the unity of those on strike, the solidarity between staff and students, or changing public opinion. Having learned so many lessons, we will have to keep learning them — and apply them in real time.